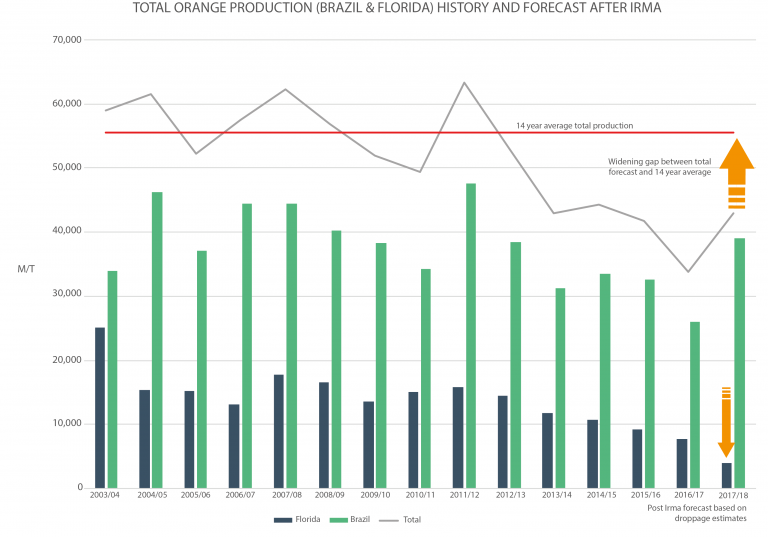 Global Orange Market Post Irma - Ultra International B.V.Ultra International B.V.
How Irma will hurt the Global Orange recovery? Let’s first gain some perspective, as there is a lot of rhetoric surrounding the impact of Hurricane Irma in Florida in September, not helped by some loose latest estimates from the USDA. We all saw the impact Irma had through parts of Florida and the immediate damage it caused to many citrus groves in the region so it came as no surprise to hear of some catastrophic losses when the USDA released its October 12th assessment. What was a surprise to many was that the figures seemed to under estimate the real losses. Some of this confusion came as a result of when the assessments were done, many of which were done before Irma struck, with the only real counts after Irma being the forecast droppage. Think about it – how can you have a droppage on orange close to 50% but only estimate overall crop losses at 26%? The USDA has recently stood behind its figures but suggested its next report to be published in November will more accurately reflect the losses. The short statement in all of this – expect further reduced output figures in the coming weeks and months! So we know that Florida producers are suffering but how does Irma’s impact affect the global supply situation – after all Florida’s contribution over recent year’s has been diminishing due to the long terms effects of citrus greening. Maybe you’re still one of the dreamers that believe Brazil is going to have such a good year that all will be saved? I hope not. Brazil’s production forecasts are set to be mightily improved on last year but total production (Brazil and Florida combined) still falls well short of the 14-year average by as much as 15,000 MT of oil or if it’s easier to understand that’s somewhere between 30-35% of what would be classed as ‘normal’ in any given year. Bringing the market back to a reasonable balance this season was already going to be a challenge but those extra losses from Florida now make that challenge even greater. If we take Florida’s losses to be closer to that 50% droppage forecasted by the USDA, its oil output will be reduced by around 3,500 MT making the gap between this year’s total production and the 14 year average now closer to 20,000 MT. That is a huge number, which represents around 8 months of production! As the Brazil season starts to churn out more oil during the last quarter of 2017, it does so with a huge backlog of orders to fulfil from last season. Pipelines are dry as are orange oil stocks around the world. Since Irma struck Florida, sales and enquiries have rocketed as many buyers look to cover requirements with prices almost becoming secondary to that of securing enough material. These combined pressures on the market have started to impact prices with increases as much as 10% seen in recent weeks. This on top of already record-breaking high prices. Forgive the pessimism in all of this but sometimes we need a reality check. People are asking daily when will prices come down but there is no simple answer. Price is driven by many market dynamics, one of which is the supply situation. All I can say, having looked into the detail of the supply, is that I cannot see any factors during this season as to why supplies will improve enough to allow any softening in price, only the opposite. Expect continued upward pressure on prices until the figures start to suggest the market is re-balancing. In reality, this will not happen this season (ending June 2018) and will probably carry through to the 2018/19 season.